Using an iPad is pretty intuitive. But you will use it differently than how you initially use an iPhone. This makes gestures and basic screen functions more important. This recipe will take us through the basics for the iPad. Pressing the Home button on your iPad is a “go to” action that provides access to the Home screen and even provides a standard action if you ever feel unforgettable with the actions of an app or if your iPad seems to be misbehaving. Unlock iPad from it’s sleep state. Use Siri. Press and hold the Home button to make a request. With later versions of the iPad, you may prefer to say “Hey Siri” if this function is activated. 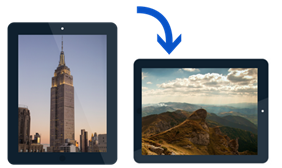 The iPad provides the ability to support either portrait or landscape orientation when using your apps. The best orientation choice is often a personal preference. If not locked, the orientation changes automatically when the iPad is rotated. The orientation can be locked so that it does not switch on this rotation. 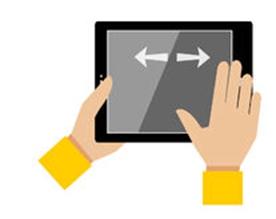 With older iPads, the slider switch above the volume buttons can be used to lock orientation. On newer iPads, the Lock Orientation button is found on the Control Center. Access the Control Center by swiping up from the bottom edge of the screen to open the Control Center, then tap the Lock Orientation button. See Using the Control Center for Quick Access to Essential Functions for more Control Center tips. Here is a review of the essential gestures to direct your iPad. Select an arrow or app function. Zoom out or reduce a photo, web page, e-mail message. Zoom in to enlarge a photo, web page, e-mail message. Press your finger to the screen and drag to the right, left, up, or down, you move around the screen. To scroll rapidly, flick your finger on the screen in the direction you wish to move. You can switch between apps you have been using on your iPad. Tap an app from the app switcher to switch to it. Close an app by swiping up from the app switcher display. A misbehaving app can be forced to quit with a swipe up action from the app switcher. Restart the app as you normally would. You can also quickly switch between apps with the four finger swipe. Place four fingers on the screen and swipe either left or right. This gesture is most useful to quickly switch between two apps that you are currently using. Describe three gestures and what function they perform.